I have been in need of a decent pair of penny loafers for a while now. Decent meaning something other than Bass Weejuns which are not very high quality, but they do make up for their lackluster construction with a great silhouette at a great price. Plus, they fit me like a glove (You can never overlook fit!). The Pinch – I am not a fan of beef rolls, I think they look too bulky and I think that full straps look too sleek, but the pinch strap closure looks just right to me. A Boxy Toe – The boxy shape is why they work so well with chinos. It is a casual loafer. The Strap and the Cutout on the Strap – The Weejun has almost a crescent moon shape cutout and bottom of the strap comes to a point in the middle. I am not that picky about the strap and cutout, but I do pay attention to it. The Allen Edmonds Cavanaugh ($275, but currently on sale for $195) has all of these features. It also comes in burnished brown. I reach for my tan loafers more often than my burgundy ones. 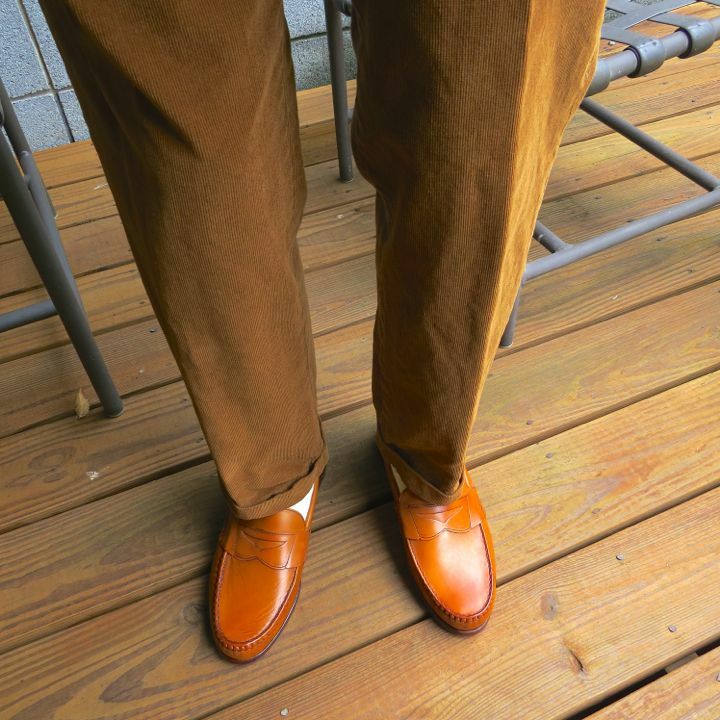 I think that by selecting dark brown I will get a lot of day-to-day use out of them like I do my tan loafers, but unlike my tan loafers I can pair these with grey wool trousers. This is important, because they will be my nicest loafers. My only critique is that I could do without the stitching on the toe box on either side of the cutout and yes, I wish it had the crescent moon cutout. Alden Leisure Handsewn Moccasin (LHS) ($518) – Great shape and amazing quality. I would love to have this loafer, but it is outside of my price range. My only critique is that I wish the strap extended a touch further down the side. Allen Edmonds Patriot ($385, but currently on sale for $327.25) – I almost purchased the Patriot, but that was before the Cavanaugh was released. The Patriot is a bit too sleek for me which is why I was on the fence about it for so long. It might just be the slightly elongated toe box combined with the more refined stitching, but it just looks a little off (especially with chinos). I do think that the Patriot makes an excellent loafer to pair with grey wool slacks. Cole Han Pinch Penny ($198) – This shoe has a great silhouette, but the wrinkling or pulling around the toe box is a “moccasin-ish” for this type of loafer. I liked the price point, but I was concerned that they would be lacking in quality. Rancourt ($300-$400? )- I have seen a pair of Rancourt pinch pennies, but they don’t have a pair on their website. I am ashamed to say that I have yet to get to give them a try. It is long overdue. Price is the only reason that I selected the Cavanaughs instead of approaching Rancourt. I must not be the only one interested in the Cavanaugh. I ordered my pair the first day of the Rediscover America sale and when I went to check out online it said that they would be ready in four weeks. I called the closest store hoping that they would have them in stock, but no such luck. For now I will just impatiently await their arrival hoping that that they fit and fit well. 12 Comments on "There’s a New Loafer in Town"
These loafers are so much nicer than the pretentious bit loafers that the Ivy Style blog insists are traditional that I think you should overlook any shortcomings they may have. I would certainly agree with “Minimalist” about bit loafers. They have no place in a Trad gentleman’s wardrobe. Those who prefer Italian/Continental-style tailoring are free to wear them with their ultra-slim shirts, tight-waisted jackets, and high-crotch, low-waist trousers. The cutout on the Cavanaugh can be seen as an ogee arch, one of the important elements of Gothic (and of course 19th century Gothic Revival) design. So in a sense this cutout is more preppy than the half moon, since Gothic Revival was perpetuated in the 20th century by Collegiate Gothic, the architecture at many of the most preppy campuses (Duke, Yale, Princeton, Trinity Hartford.) Indeed Gothic Revival is not only the ancestor of the Arts & Crafts Movement, but also of the many houses in the Stockbroker Tudor style of the 1920s. Of course not everyone wants their clothing to reflect architecture. Conifer – Thank you for taking the time to share. Although I am not an educated fan of architecture I am a fan. I had ankle surgery and must wear a ballet type flat. Oh how I miss my weejuns! FYI you were correct to skip the pinch penny. I have had three pairs and while they are super comfortable, all three pairs split in the exact same place in roughly one year’s worth of wear. Hank fully, I found a different Cole Haan loafer that works perfectly for me (Air Aiden). Excellent choice, OCBD! The nicest new loafer introduction in many a year! I’ve ended up having several different AE loafers, but the Cavanaughs are my favorites. Still, I’ll never give up my Weejuns (and I’m sure you won’t either). They’re just SO collegiate! They take me back in time. In my case, that’s WAY BACK in time! Ox, congrats on the purchase and I can’t wait to hear your review on the Cavanaughs when you get them in (I wouldn’t mind hearing what Billax thinks of them, either). I was actually contemplating pulling the trigger on a pair in the same brown color, but now that I know they’re four weeks out, I’ll hold off. I’m not a fan of beefrolls myself and I think the Cavanaughs really have that perfect penny shape. I will have to disagree with you (though it’s purely a matter of opinion) on your preference for the half-moon and stitching pattern of the Weejuns. The Cavanaughs (as well as AE’s old full-strap pennies, the Camerons) have a neat stitch pattern that frames the ogee in the center of the plug and lets the strap “float” over the plug/vamp seam, which I think is a great detail (I’m an architect, what can I say). I’ve also got a pair of USA-made Weejuns kicking around in my closet and I really don’t like the strap stitching at all. Funny how those little details elicit strong reactions from different people. Billax – Thanks. Yours looks great. I will never give up my weejuns either! OCBD – Those Cavanaughs look really nice. I actually prefer the ogee cutout to the Weejun shape. Of course I’ve never had a pair of Weejuns that came even close to fitting well. Weejuns are always way to wide in the heel for me. OCBD, I’m in the market for a pair of Weejuns because that’s what I can afford at this point and they fit me well. What are your thoughts on the Bass Logan v. the Bass Wilton? Thank you for your input. GLH – I understand your position well. I have only had Logan’s until I purchased a pair of Wilton’s a week ago. I am not fully certain of the differences between the two except for the cutout is an ogee shape opposed to the Logan’s moon shape. I have only worn them once and I they fit like my Logan’s so I was happy with that. If I think of anything else I will follow up. I hope this helps!